I've had all three singles released by The New Order during 1966 in my collection for a number of years but only this morning I decided to remaster them all and conduct some research. New Order were based in NYC and were the brainchild of successful songwriters Billy Barberis and Bobby Weinstein. Another important member was probably Roger Joyce who has a songwriting credit for all six songs they released on record. 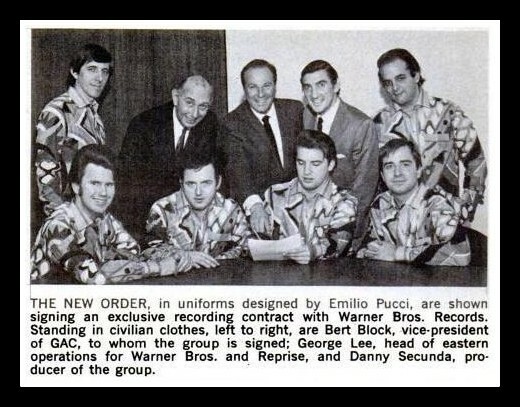 The Barberis - Weinstein partnership had been around for several years before the creation of their group The New Order. They wrote songs for many artists including "Let The Sunshine In" for Teddy Randazzo, also recorded by Dee Dee Sharp and Georgie Fame. They also wrote "I'm Lost Without You" recorded by Billy Fury in 1964. None of The New Order singles appear to have had much acclaim and I can't find any evidence that any of them charted in America. 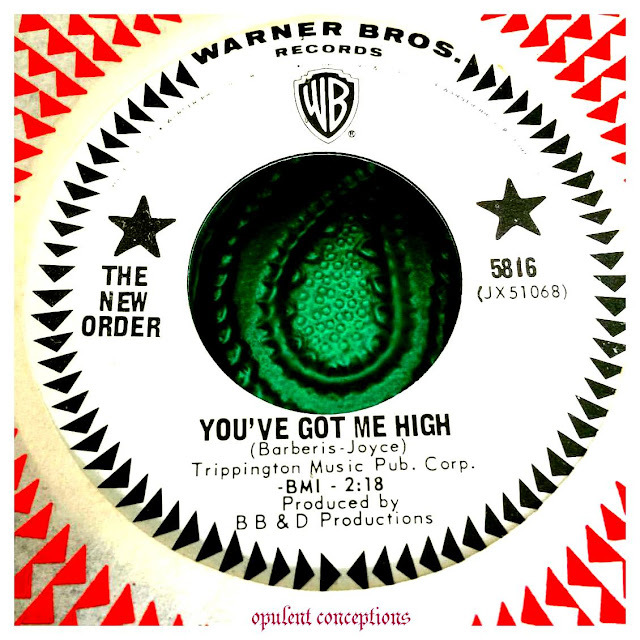 The first single "You've Got Me High" is a terrific uptempo fuzztoned rocker with some smooth harmonies. It's therefore no surprise to learn that the group was comprised of six members. The song comes over like a garage version of The Association. The flip "Meet Your Match" is an edgy Dylanesque folk-rocker. 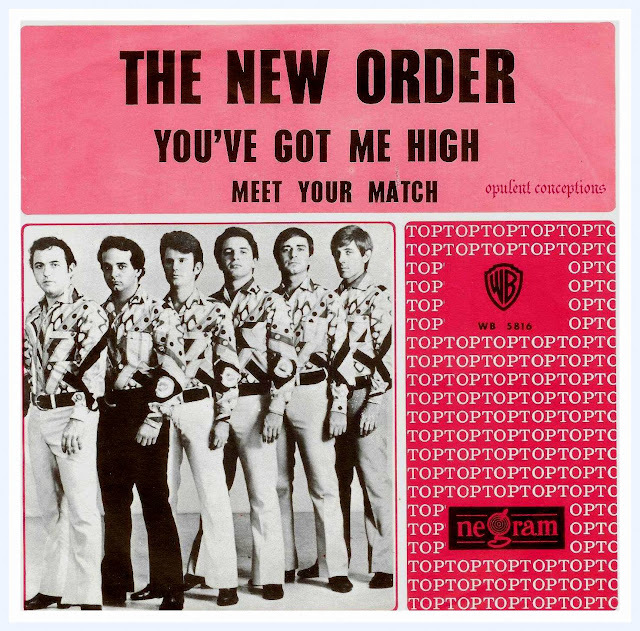 Both sides are worthy openers but only "You've Got Me High" has troubled the compilers. I first heard it on "Psychotic Reactions" in the early 90s. Curiously, Swedish band The Science Poption also recorded the song in 1966 and Bam Caruso picked it up for their Rubble compilation "Magic Rocking Horse" in the late 80s. The second New Order single was the equally superb "Why Can't I?" which is another vibrant rocker with a happenin' guitar break. 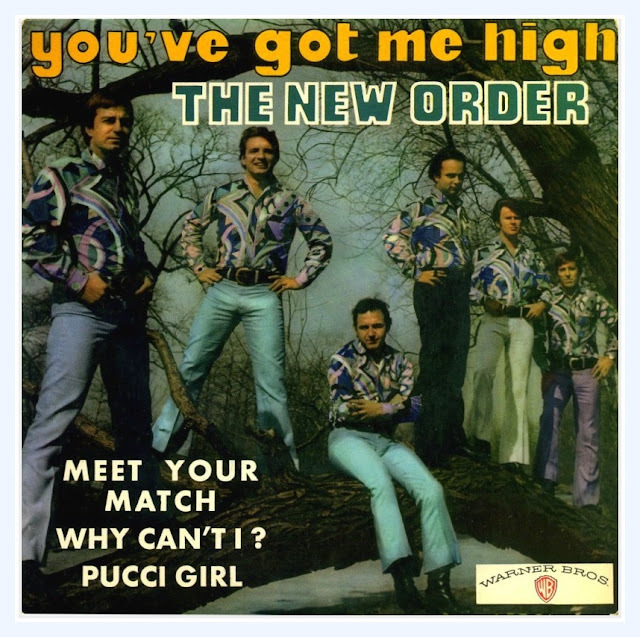 On the other side is a jangly pop song titled "Pucci Girl." The New Order wore Emilio Pucci (fashion designer) clothes so probably wrote the song for him to get free clobber. The third and final single was in a totally different direction. No longer garage rockin' but smooth soul pop music. Not my kinda bag but I'm sure many people will dig it. 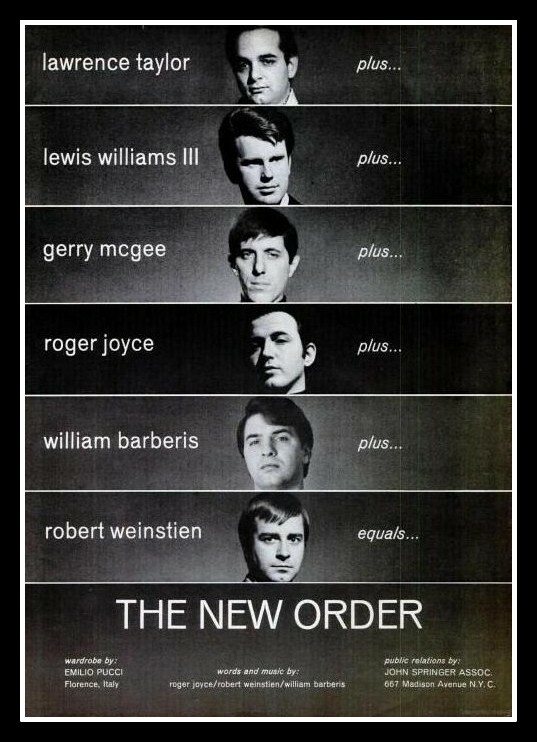 On the label they're called New Order featuring Roger Joyce. I don't know the reasoning behind this. both Gerry McGee and Lawrence Taylor have a Ventures connection. Gerry played with the group in the post-Nokie Edwards era; he was with the band when I saw them in the mid 80's, playing a paint-peeling "Green Onions" that I still remember after all these years. Taylor's brother was Ventures' drummer Mel Taylor. Gerry's on tons of L.A.-based stuff, Monkees, Sandy Nelson etc.